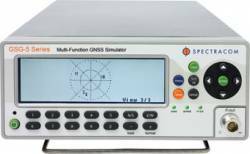 Spectracom has announced the GSG-52 RF Signal Generator, a new offering in its line of GPS constellation simulators. The GSG-52 is designed for in-line product testing of navigation-fix and positioning functions of integrated GPS or other GNSS receivers. In a compact portable form factor, the signal generator offers four-channel simulation and a list price of less than $10,000. The GSG-52 user can configure scenarios on-the-fly without the need for an external PC and re-compilation phase. Via the front panel, the user can modify parameters such as user position, time, and power output. With the optional StudioView software, the unit facilitates creation of scenarios via a Google Maps interface. 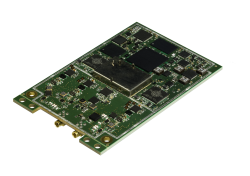 According to the company’s CTO, John Fischer, the GSG-52 is fully upgradeable to a higher level of functionality at any time, including increased channel count up to 16 channels, receiver trajectory control, and satellite-based augmentation system (SBAS) simulation. The new signal generator also provides for an upgrade path for dual GPS+GLONASS receivers in the future, he says. Spectracom, a member of the Orolia Group of companies, suggests that the GSG-52 can be applied to leap-second testing, noting that users and developers of critical GPS systems have until June 30 to evaluate effects of the planned leap-second discontinuity on their devices and software.The first leap second since late 2008 will be added to the official time scale on that date. The GSG-52 is currently available from Spectracom and its distributors.